Aquarium setup: Require planted community tank. Due to their susceptibility to ammonia and nitrite poisoning a planted tank is recommended. A stable tank is also a must. Mid to Heavy planted with plenty of leafy plants. Feeding: Filter feeders that also combat a lot of algae types. They will feed on sinking wafers and fallen debris. Combat hair algae, brown algae, black beard algae, and normal algae growth. 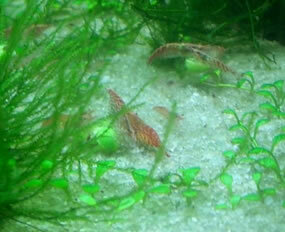 One of the best, if not the best, algae eating shrimp available. Breeding: Rather easily breed in the aquarium. Egglayers that will spawn at will. Female will hold eggs 15-20 days. Her underbelly will turn yellow while holding eggs.